HEADLIES - Conquistadors Continue Not Living Up to Their Name - WrestleCrap - The Very Worst of Pro Wrestling! WCNewz was on hand last night for an Indy Event, where the Tag Team known as Los Conquistadors continued not living up to their name. For more than a quarter of a century, multiple wrestlers have worn the gold bodysuit/mask combo, wrestling in losing efforts in Japan, New Zealand, Mexico, the US and other locales across the globe. They were most famous for their losing-ways in the WWF, circa 1980’s. But in all that time, Los Conquistadors have summarily failed to conquer any territory, government or opponents, save for a shocking Canadian house show victory over the Fabulous Rougeaus back in 1989 and as a surviving Team at the 1988 Survivor Series, alongside the more-formidable Powers of Pain. Los Conquistadors were then called into the ring and beaten in 45 seconds, extending their reign of nothing conquered, nothing gained. 8 Responses to "HEADLIES — Conquistadors Continue Not Living Up to Their Name"
This is way more entertaining than their actual gimmick was. I’d have marked out for this so hard if they actually tried to take over the places they wrestled. 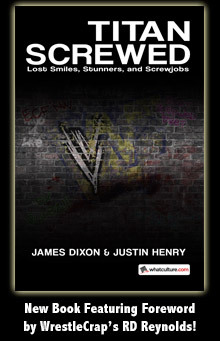 I still resent their being robbed of a the countout victory at Survivor Series. Is this really a Headlie? It’s pretty factual. I concur these two haven’t conquered a thing and are complete frauds who need to be sued for false advertising. I heard they settled out of court in a class action suit filed by spectators who were blinded by their bright gold threads. If it wasn’t for the Dumpwater Floridian, I would have never met the man who met Andy Griffith. (I know some of that is because its almost always looking at ancient wrestling history, so its having some fun with stuff that’s so old it’s hard to get depressed about — whereas anything about the current product also makes me sad and reminds me why I haven’t watched wrestling for half a decade). But I think some of it is that the shorter histories of tiny, doofy gimmicks like The Conquistadors or The Shadow gives more time to talk about the hard-working journeymen under the mask who went out there and jobbed their hearts out to try to put the current flavor-of-the-month over. It was also fun because many of the articles seemed have “Pistol” Pez Whatley decked out in his tux/bowtie/tighty-florescent-greeny best, blazing a trail for recurring photos like the Man Mountain Rock-s and Generic Blonde Tiffany-s of today! Ok, I should wrap up before it goes on too long (too late! ), but I just wanted to say: I bet no one can sing the praises of the potbellied, mulletted, or generic-luchador-masked like Blade “Mr. Blake Brakes Town” Braxton, but if you guys wanted to have a spin-off column — say, “Mid-Carder of the Month”, where we look at the rise and stalling-out of an otherwise faceless wrestler’s short-lived push — for the love of polo, that’d be great! 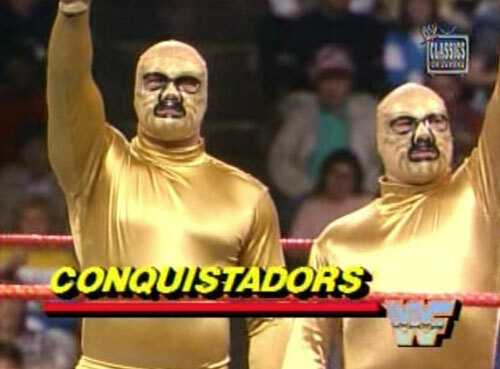 Yeah, Los Conquistadors weren’t a surviving team at the 1988 Survivor Series. The were the final team on Demolition’s team and were quickly eliminated by Powers of Pain to end the match.